First of all, I’m sure some of you might be wondering what this ‘entertainment book’ is all about. As far as books go, it’s not all that entertaining a read. It does help you save money on all kinds of expenses including entertainment. The book is packed full of great coupons. 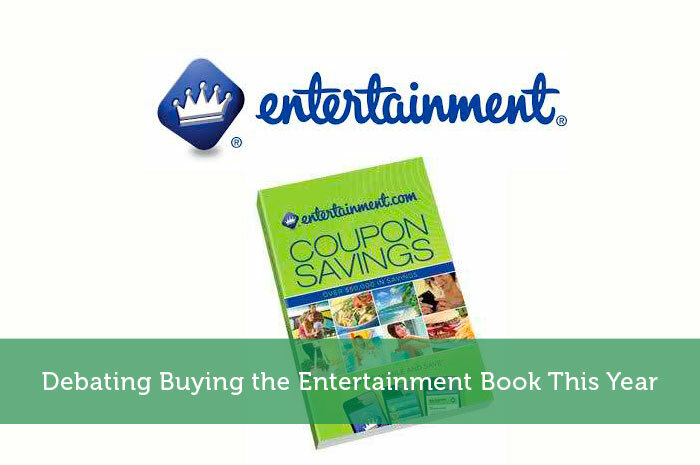 I assume the Entertainment Book was originally focused on entertainment coupons, but that is just scratching the surface…. Restaurants – The bulk of the coupons are for restaurants, ranging from fast food up to 5 star dining and everything in between. Usually the coupons will get you a free entree when another entree is purchased. At $10-20+ per pop those add up quick. Grocery Stores – For the grocery stores here there are coupons to use for each month. I assume it is the same deal for other areas. The problem for me is that it happens to be the grocery stores I don’t normally shop at. Fun Activities – I guess this is where the entertainment part comes in. Think stuff like tourist hotspots, sports, movies, etc. With the number of golf courses included, golfers must ove these books. Services and Shopping – Ok the shopping section is pretty weak, at least it is for my area. Then again I’m not big on shopping anyway. In the services section though, I’m able to save on all my oil changes. Rather than exclusively targeting national companies, the books each focus on a specific city or area. That way you can be sure that all the coupons are for companies with nearby locations. By now you’re probably wondering why this post title is about debating buying the Entertainment Book. Truth be told, writing this post really was me debating whether I should buy it or not. I’ve been buying the book for the last 3 or 4 years now and have had a ton of savings from it. Something is holding me back though. Increased Spending – Although the coupons save a decent amount of money, they also encourage spending. For example if I’m trying to avoid going to restaurants, the coupons could be a tempting excuse. Pricing – It is very easy to recover the cost of the book by using 3 or 4 coupons. The catch is that if you can wait a bit the books eventually go on drastic sales. For the 2014 books you can currently buy them for $10 or less. That’s how I ended up with 2 books in my drawer…just too tempting. Limited Options – Maybe it’s just me but I found that I was limiting my options too much based on what I had coupons for. On the bright side I’d be saving money on lots of outings and purchases, but it makes me wonder what I was missing out on. For the price, I think these are worth it as long as the spending can be controlled. I definitely see the con of these enticing a person to spend more than they would normally. Oh! I like this concept of entertainment book. With $10 or less, I think it’s a good buy. Though you may end up buying unnecessary things at times, but this great coupon book will help you buy your requirements with much lower price! An organization I am involved with sells these, so I buy one every year. I’ve noticed each year I use the book less and less. I’ve also noticed some of the establishments that were always in the book are no longer featured. Next year I’m not buying one. I doubt I’ll even get my $35 back this year. I miss entertainment books! There used to be a similar one in my small town, but it doesn’t exist anymore. I always wrote down the savings in the front cover, so I knew if I was getting any value out of it or not. I think a lot of the value in them has been replaced by Groupons and the like. I got a great deal on the Entertainment book a few years ago. I think I bought it for like $4 or so. I used enough coupons to get my money back, but not much after that. For me, the coupons were mainly for places and things I don’t use. I would be tempted to spend too much extra, particularly going out to eat, with a book full of excuses like this. I would have to pass just to control my budget. Entertainment book sounds interesting. I have not buy one ever since. But my friend told me it can help you buy something you need in a lower cost. I’m gonna try it out soon. Great post! The price of the entertainment book is worth it and you can have all the discounts at some things. It can be really helpful, for some, it’s not. For me, it’s really your responsibility on how to use it properly. While stopping at rest centres during road trips, I have seen the “free version” of this type of coupon book. Since you’re paying for it, I assume the coupons would be way better. For someone who has done a staycation and isn’t really into local travelling (I can’t help but love international travel. It’s my Achilles heel), I’m not sure this entertainment book would be worth it for me. However, as the website says, I agree it would be a great gift for families or people who enjoy going out and doing things in the area. I’ve never actually purchased the entertainment book. The one time I considered it was because there was a coupon specifically for something that I was going to do, and with the coupon value the book would have only been around $5. I didn’t get it though because I ended up finding the coupon elsewhere for free and you’re right, the spending it encourages is not healthy. I bought this book the past few years because I was new to the area & was looking for places to go. The book is getting worse each year with closed businesses. Their website constantly has wrong information & they don’t correct it. Too many restaurant offers are buy one get one free. Being single makes those useless most of the time. Emailing the company is pointless – they respond with their generic reply yet never address the problems. They leave closed businesses or incorrect addresses online. You print out the coupon & waste gas & time to find out the placed has moved or is no longer in business. I used to buy this every year…then I stopped when I realized it’s always the same places in the book and I was tired of those places! Plus in the last few years the savings have gotten lower because a lot of businesses have pulled out from the book. Many times I’m able to find a discount elsewhere rather than looking in the entertainment book too.